The curator of the 56th Venice Biennale has revealed the 136-strong list of participating artists for the International Exhibition, including works by many high-profile names such as Steve McQueen, Jeremy Deller and Oscar Murillo. 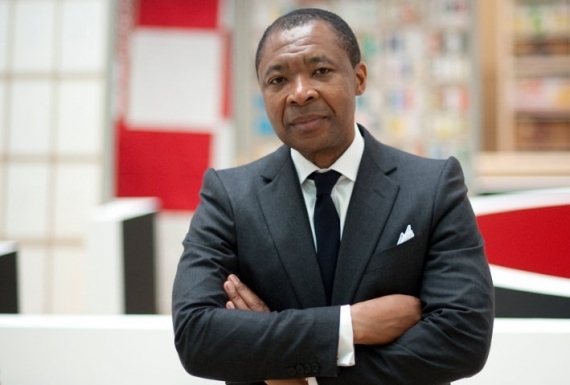 The full list of artists participating in the 56th Venice Biennale exhibition, curated by Okwui Enwezor (pictured), has been unveiled, with over 136 artists from 53 countries. Of these, 88 will be showing at the Giardini and Arsenale for the first time. The International Exhibition is entitled All The World’s Futures and sets out to reflect ‘the current disquiet that pervades our time’. It includes newly-commissioned works from a number of high-profile artists including Walead Beshty, Christian Boltanski, Raqs Media Collective, Philippe Parreno and Tania Bruguera. Among the UK-born or based artists involved in the main show are Jeremy Deller, Steve McQueen, Chris Ofili, Isaac Julien, Sonia Boyce, Oscar Murillo and Helen Marten. In addition, pieces by seminal historical figures such as the photographer Walker Evans (with a complete suite of prints from Let Us Now Praise Famous Men), filmmaker Sergei Eisenstein, multimedia artist Chris Marker, and painters such as Tetsuya Ishida and Georg Baselitz will also form part of All The World’s Futures. Venice Biennale president Paolo Baratta described many of the selected artists as coming from “geographical areas that we paradoxically insist on defining as peripheral”. The 89 National Pavilions will feature newcomers Mauritius, Grenada, Mozambique, Mongolia and the Seychelles, while Ecuador, the Philippines and Guatemala are returning after several years of absence. b. 1982 Bahamas, lives and works between Chapel Hill, North Carolina and Washington DC.